The exact circumstances of the emergence of what are now known as the rNying ma traditions of Tibetan Buddhism remain among the least clearly defined areas of Tibetan history for modern scholarship. What has made the early history of rNying ma tantrism so opaque is the dearth of reliable historical sources. In response to such uncertainty, Cantwell and Mayer have turned to the Dunhuang cache in search of further evidence. Their specific focus has been the Dunhuang texts on Phur pa, many of which have never been read before. This focus was chosen because from comparatively early times, the Phur pa tradition developed enormously within Tibet itself, and always remained a particularly rNying ma practice. Phur pa's early and enduring popularity might therefore to some extent coincide with or reflect the emergence of rNying ma as a distinct tradition. This volume addresses an important question that has not so far been approached: how exactly do the Dunhuang tantric texts compare with those of the received rNying ma tradition? The authors review, transliterate, translate, and analyse all Dunhuang texts on Phur pa so far identified, discovering an unexpectedly close relationship to the received tradition. 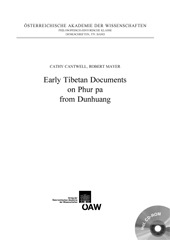 There is also an essay exploring reasons for Phur pa's popularity in post-Imperial Tibet. Thanks to the generosity of the British Library, a CD is included with digital images of over 100 pages of the original manuscripts.